This fall, Duke University showed off its newly renovated Baldwin Auditorium, a 685- seat performance hall that is home to the school’s music department, as well as touring acts booked through the college’s on-campus agency, Duke Performances. 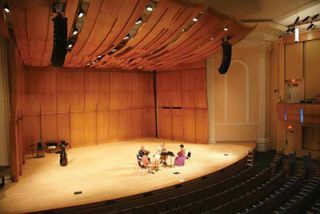 For the renovation of Baldwin Auditorium at Duke University, Jaffe Holden and the architects created a room within a room to improve sound for acoustic, unamplified, and amplified performances. One of the main goals behind Baldwin’s facelift was to drastically improve sound for acoustic, unamplified, and amplified performances. Working in conjunction with Ray Walker, Duke’s staff architect, as well as Pfeiffer Partners Architects out of New York, NY , the Norwalk, CT-based consulting firm Jaffe Holden was charged with designing the acoustics for the space—including noise control and isolation—as well as the design of the audio system. Matthew Nichols, consultant at Jaffe Holden, explained that the original space was very wide, producing less than favorable acoustics. To address this, Jaffe Holden and the architects created a sort of room within a room by bringing in the side walls, creating new walls, and carving out space for outside of the auditorium that allows for circulation between the front of the house and the back. The new walls are fabricated out of three layers of drywall with articulating shaping, which provides diffusion around the entire auditorium. New wrap-around balconies were constructed, resulting in new vantage points for audience members, as well an opportunity to provide acoustical diffusion for unamplified musical performances. Signature to the space was an existing large-domed ceiling, which serves to conceal some acoustical diffusion properties as well, preventing reflection back onto the stage area. Admittedly impressive is the overhead wooden canopy, comprised of individual members that curve in two directions. Gaps were designed into the canopy to allow for some of the sound from the stage to escape, and also to create space for lighting, rigging, and speaker arrays. Curved, wooden plugs can be flown out onto the speaker lift lines so that when the loudspeakers are removed, there is no evidence of holes. One element that was expanded during this renovation was Baldwin’s stage, which now spans 2,000 square feet. To supply air to this area, the stage is constructed out of perforated wood—over 75,000 holes were drilled into the flooring, which houses an air supply plenum underneath. “It’s almost like an air hockey table,” Nichols joked. The main arrays are each comprised of 10 Meyer MIN As. Ten Meyer UP-4XPs act as front fills, with a pair of MM-4XPs for side balcony fills and two UPJ over-balcony fills. Four Meyer 500-HP subwoofers, mounted on isolation platforms, are integrated into the stage apron. The speakers are on motorized winches so that when the auditorium is being used for acoustic performances, they can be dismounted and stored on carts.